Nice atmosphere, relaxing and peaceful: these are all descriptive of this villa. 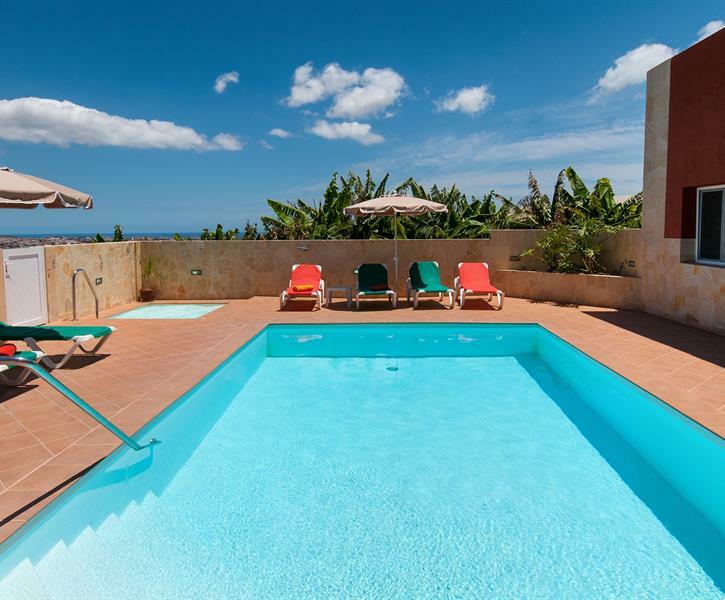 It offers a wonderful sea views from its terraces, a spacious swimming pool and a jacuzzi agr. Our wee family had the best holiday here, everything hat we needed was at hand, the communication with Spain-Holiday team was good. I recommend this villa. We are a familly of a child still in Leukaemia treatment. So clean is SUPER important to us. We would recommend this property to other famillies in our situation. We had some great time there. Villa is very modern and spacious. It was equiped in everything that we needed. (washing powder, soap, dishwasher tabs, Bbq coal So our role was just to move in and start relaxing;) it is really nice that ovner provides such supplies. We were in a group of 10 person with 3 cars ( car is obligatory) and there was enough space for everyone. There is no need to go anywere from villa. You can stay whole day at the pool or in jacuzzi you can leave villa only for shopping and dinner if you don't want to cook in one of 2 kitchens ( one outside). Location is quiet, you can calm down or organize loud parties;). Only wan drawback was that the jacuzzi had everyday a different temperature. One day it had 28 on the other one it was much lower. To sum up it was so far the best villa i have been to.